ISIS Has Lost its Capital City. But the War After ISIS Is Just Beginning. ISIS has lost their capital in Syria, the city of Raqqa. Before they captured Mosul, Raqqa was ISIS’s stronghold. It became their de facto capital, where they forged their terrifying public persona through videotaped beheadings, the persecution of Christians and other religious minorities, and their ruthless morality police. For three-and-a-half years, ISIS ruled this place with an iron fist. Now Arab and Kurdish forces backed by the United States are celebrating victory in Raqqa, hoisting their flag in triumph. This is an important military victory, But it’s way too early to pretend that ISIS is defeated. And not just because there are still allegedly ISIS fighters holed up in parts of the city, making their last stand. The military declaration of victory tends to precede the real thing, sometimes by days or even weeks, as we saw for ourselves on the frontlines of Mosul a few months ago. But more than that—the end of the war against ISIS, when it finally comes, will not be the end of violence. By all accounts, Raqqa is destroyed. From a drone’s eye view, the city looks a lot eastern Aleppo did last December and Old Mosul did in July: rubble and dust and devastation. But Raqqa is more than what you see on the news. 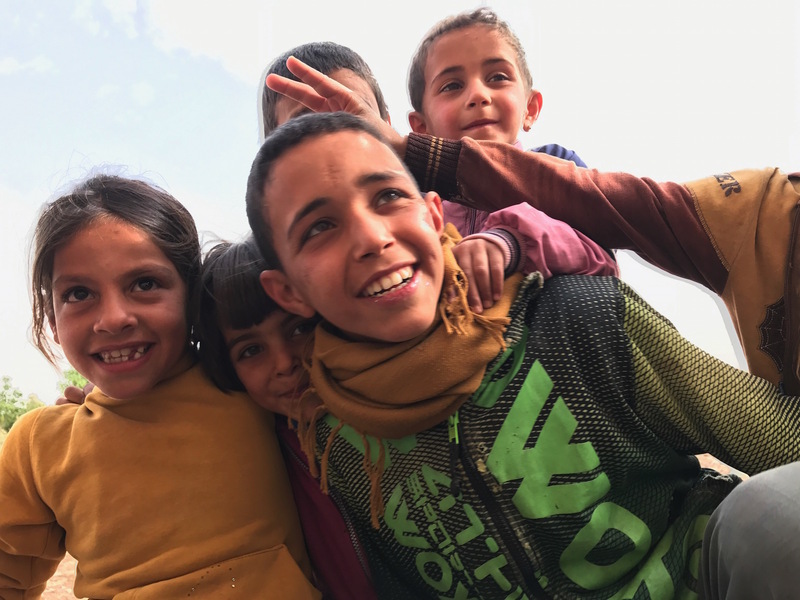 Raqqa is home to people—more than 200,000 of whom lived here before war plunged almost all of Syria into darkness. I was with part of our team a short distance outside Raqqa, shortly before the military offensive began. We had the privilege of meeting some of the families who’d managed to escape. One family we met had fled on their motorcycle—mom (pregnant), dad, and all eight kids piled precariously on top. As we sat and listened to the story of their narrow escape, their daughter Shama peeked out from the shed where they are now living, with nothing inside but a few blankets and couple of buckets. A little further down the road, I met Abu Zaynab and Abid, who had been pushed out of their homes as well. They rolled out the picnic spread for us and served us coffee in the middle of their misery as their kids buzzed around and made silly faces at the camera. In spite of the smiles, it was one of the most heartbreaking moments I’ve experienced in all my years on the frontlines of conflict. Abu Zaynab lives in a tent outside a friend’s house, where he cares for two orphaned children. When it rains, their tent floods. “We are so hungry,” he tells us. This is what I refuse to lose sight of, amid the all the premature declarations of victory in Raqqa. Because for Shama’s family, it’s not over. For Abu Zaynab and Abid it’s not over. They told us that some of the same soldiers who’ve fought against ISIS now shoot at them and refuse to let them return home. The war after ISIS is a war for who controls the land ISIS lost. Arabs? Kurds? Rebels? The Syrian government? When you sit where we’ve sat, when you drink tea with families who lost everything, you realize that the end of ISIS, when it finally comes, is at best the beginning of the hard work. These people had their lives taken from them. They are living in some of the most dire circumstances imaginable. They’ve worked hard just to survive, and they’re working just as hard to get back home and rebuild and bring dignity and honor back to their communities. This is a huge part of the work that we’re just now able to start in Raqqa. A few hours up the road in Aleppo, we’ve been at it for a while—rebuilding homes, bringing in generators to turn the lights back on, feeding displaced families, providing mobile medical care. Aleppo was decimated by war almost a year ago, and the work is still going on so that families can come back and rebuild their lives, homes, and businesses. So they can start turning the next page over, to what comes after the bombs fall and the bullets fly. The defeat of ISIS in Raqqa will be hailed as a victory—and not for nothing. But it’s not the victory my heart is yearning for. It’s not the victory that families who fled Raqqa are yearning for. It’s not the victory that Shama is yearning for. And I refuse to believe that it’s the victory you’re willing to settle for, either. Yesterday we launched our new monthly giving community, The Frontline. This community is the reason I’ve already approved our team to launch an emergency response in Raqqa. We didn’t have to wait for CNN to carry the story on the news. We don’t have to wait for President Trump to make a speech. And we don’t have to stop responding just because it’s already falling out of the 24/7 news cycle. We can start responding now. Getting inside Raqqa has been almost impossible since ISIS took control. But we are ready. We are ready to provide what families need to rebuild—emergency food deliveries, medical care, home repairs, and more. We’ve done it before in Syria. And we’re ready to do it again for Raqqa. And the only reason we can even dream with our friends in Raqqa about life after ISIS is because you are here with us. The more of you who give whatever you can, month after month, the bigger we can dream. The more we can accomplish. The better story we can write on the page that comes after ISIS. Join The Frontline, our monthly giving community, and show up for the people of Raqqa. Give monthly to join The Frontline. I want to pledge monthly to	Join the Frontline.